« Maltese Shooters to blame for high pigeon numbers throughout the island! Hen Harriers & Peregrine are likely to disappear as a breeding species from English Red Grouse moors within the next decade, or less. 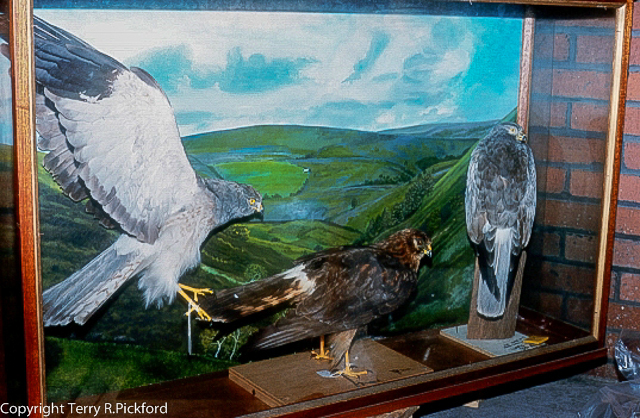 The 3 stuffed Hen Harriers inside this display cabinet formed a small part of a larger number of illegally shot Bowland raptors which were confiscated by Lancashire police under a search warrant from the home of award winning photographer Dennis Green. When police raided Greens home they uncovered several cases of stuffed raptors together with 99 additional stuffed birds stored in the photographers garage, enough material to fill two transit vans. None of Green’s co-conspirators were ever charged with killing any of the exhibits recovered by the police. Read here the full account of Dennis Green’s conviction resulting in a prison sentence. I know what is happening to our so called ‘protected raptors’ in the Forest of Bowland, in Lancashire, and on other red grouse moorland in northern England, so does the RSPB and everyone else associated with the conservation of these threatened birds. The problem is no one other than the North West Raptor Group has had the courage to speak out about their demise resulting from systematic persecution throughout the last 47 years. The situation is so transparent its heart breaking to have to sit back and watch these losses continue year after year while nothing is done to prevent what is taking place. There is no other explanation for the abandonment of 16 Bowland Peregrine territories since 2010, or the disappearance of the 4 male Harriers from the Forest of Bowland and an additional the single male Harrier from the northern Pennines in 2015. The game shooting brigade continue to deny the obvious, covering up the realities of what has been taking place on moorland they manage for red grouse shooting. In the case of the 5 missing male hen harriers it is ridiculous for anyone to even consider natural causes for such multiple disappearances from two relative small moorland regions of England within the same season. Throughout the breeding cycle all male raptors are motivated by a strong biological urge to return to their nests with food to feed their mate, along with any chicks contained in their nest. This behaviour ensures the success of their eggs and chicks. In the case of the 5 missing male Hen Harriers, these multiple losses point to one reasonable conclusion, the birds are dead, most likely shot. Dr Derek Ratcliffe, former chief Scientist at the Nature Conservancy was correct, for many decades these birds have been disappeared due of persecutors not the weather, not a lack of food, or because of predation by other animals. I firmly believe without immediate proactive action by our Tory government, supported by improved effective enforcement by the police to bring an end the persecution of species like Hen Harrier, Goshawk, Short-eared Owl and Peregrine, these so called protected raptors are doomed to disappear within the next decade from all heather moorland where the red grouse is shot in northern England. Brood meddling is certainly in this case not the answer, the majority of fledged Harriers produced by such a pointless scheme, will simply provide cannon fodder resulting in more Harriers being shot. In the spring of 2017 bird watchers in their hundreds flocked to the Forest of Bowland just to catch a glimpse of the male Pallid Harrier. For several weeks the display carried out by this single bird thrilled everyone who took the trouble to walk up the Dunsop Valley. The decision taken by the RSPB to make public the Harrier’s arrival in the Whitendale Valley last year saved the Harriers life, at least during his short stay at this moorland location. The Pallid Harrier suddenly disappeared from Bowland, and we understand has not been seen anywhere in Britain since it vanished. It is possible the bird has made its way back across the north sea into northern Europe, however this seems very unlikely as someone somewhere would have witnessed the Harriers presence before leaving our shores. There are two other possibility, the Pallid Harrier never left the Forest of Bowland. The Pallid Harrier met an untimely death on moorland well away from the Forest of Bowland. I doubt now if we’ll ever discover the truth. The RSPB know what happened to all the 5 missing male Hen Harriers in 2015; indeed they may already have their suspicions of who was responsible for this unacceptable outrage. I also know the cause for the demise of the 39 breeding pairs of Bowland Hen Harrier in the early 1970’s and once more in the 1990’s when many more Harriers also disappeared. 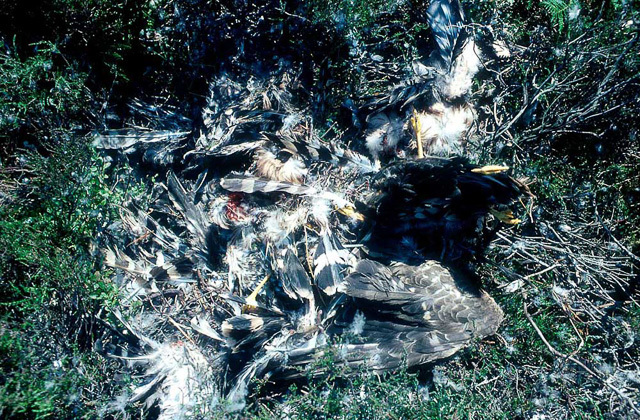 In both of these periods members of the North West Raptor Group regularly discovered destroyed Hen Harrier nests on all estates in the Forest of Bowland containing smashed eggs, dead Hen Harrier chicks with their heads cut off then left left in their nests by the perpetrators as a clear symbol that they were in charge. During these dark periods the numbers of adult Hen Harriers and Peregrines which simply disappeared from occupied Bowland territories amounted to many hundreds of birds, all presumed to have been shot and their nest content destroyed. Despite the wide scale killing of raptors across the whole of Bowland since 1974, not one single raptor killer has been so far brought into court to account for this criminal activity. In the early 1990’s I recall two interviews which the BBC carried with Dr Derek Ratcliffe, English Nature’s former Chief Scientist, and a second interview with the Late Duke of Westminster regarding the collapse of the Forest of Bowland Hen Harrier populations which occurred in the mid 1980’s and again in 1992 and 1993. When the producer of this documentary asked Dr Ratcliffe what in his expert opinion could be the cause for the disappearance of so many Hen Harriers and their eggs, Dr.Ratcliffe replied “he could only think of one reason, persecution.” You can watch both of these important video clips below, and we should all bear in mind what what Dr Ratcliffe said all those years age about the reason for Hen Harrier disappearances, these reasons are as true today as they were all those years ago. I often wonder what powerful influences are pulling the political strings behind the scenes in this important moorland region of Lancashire designated as an SSSI and SPA? Publicity is the enemy of the persecutor, while silence will always continue to promote such criminal activity.Watch the video below where the BBC are interviewing the late Duke of Westminster at his Forest of Bowland home at Abbeystead about the disappearance of hen harriers and their eggs in 1992 and 1993. In 1974 I was invited by Richard Porter head of the RSPB’s species protection to visit Sandy and brief him all about the illegal persecution of both Peregrine and Hen Harrier taking place throughout the Forest of Bowland. I thought I did a good job and I could tell Richard was taking an interest in the criminal activities I was telling him about. However, when I was about the get into my car in the Sandy car park to travel home, Richard told me I should not worry too much as the RSPB would have the problem of persecution in Bowland resolved within the next 5 years. As things turned out historically, Richard’s claim was one of the most optimistic statements I have every had the misfortune to listen too. Here we are forty seven years later and the persecution of so called ‘protected birds of prey’ throughout the Bowland region is now much worse than it was all those decades ago. For two consecutive seasons (2016 & 2017) there were no breeding Hen Harriers recorded in the Forest of Bowland, or upon any English red grouse moor in England. There were however two successful Peregrine nests in Bowland in 2017, both on moorland owned by United Utilities; at least that’s better than no successful nests at all. If the four Hen Harriers tagged in Bowland in 2014 are included, we have a total number of fifty one birds fitted with satellite taggs. Looking at the NE report, only seen birds (including two of the four 2014 Bowland birds) could be confirmed as alive. Forty four satellite tagged Hen Harriers are confirmed dead or missing. We are very good at telling other countries how to look after their wildlife; we should take a long hard look in the mirror and start taking the drastic action required to protect our own vulnerable raptor species. We know that a lack of food and climate change are not to blame. These raptors are persecuted illegally by humans. Before messing about with any brood medling, the criminals responsible must be caught and prosecuted for what they do but sadly are not. I would have liked to end on an optimistic note, but sadly that is not possible. The loss of the two satellite tagged Hen Harriers (Sky and Hope) from the Forest of Bowland September 2014, which I believe were shot and their tags destroyed was bad enough. But what followed in 2016 was in my view much worse if that was possible, when five male Hen Harriers all disappeared in the spring of 2015 from several nests in Bowland, and a single male vanished from the one nest in the Pennines. There is simply no mechanism available at this time to prevent these criminal activities taking place time after time. Withholding licenses from experienced raptor workers who had made a significant difference up until 2010 simply plays into the hands of the persecutors making it that much easier for them to get away with the crimes they commit. I see no advantages of producing more Hen Harrier chicks by brood meddling until the reasons for these losses, i.e., persecution, is adequately addressed. If this is not done then DEFRA’s proposals would only serve to make a bad situation much worse by providing more birds to be destroyed once they make their own way back to the grouse moors in northern England, thats if they get that far. RSPB publish last known locations of the two missing satellite Tagged hen harriers ‘Skye’ & ‘Hope’. Peregrine ‘holocaust’ looms on northern England’s upland – A final solution. Video Version: Peregrine holocaust looms on England’s Uplands. 2 comments to Hen Harriers & Peregrine are likely to disappear as a breeding species from English Red Grouse moors within the next decade, or less. Given the fate of the Bowland Hen Harriers, it’s obvious what happened to the beautiful Pallid Harrier. During a period of bad weather it disappeared, when watching friendly eyes would have been very few and their visibility greatly restricted by the weather, a gamekeepers opportunity to do their nasty business. Another sad ending of another fantastic bird. I can’t prove this, but it’s very highly unlikely that I’m wrong. Editor’s Comment, Sadly Adam you may be correct, otherwise someone somewhere would have reported seeing the bird. Exactly! That poor bird could not have chosen a worse place to go to in all of England. Sadly though only 5 or 6 years ago it would have been one of the safest places for a Harrier to set up home! The Bowland story is a national scandal of wildlife crime at its worst!